Tom Noddy's book, Bubble Magic was one of the first popular books about blowing bubbles. It is very difficult to find now-a-days. The book has chapters titled Tools, Beginning Bubbles, Beyond Round Bubbles, Cosmic Bubbles, Fizzix, and A Magic Nation. It also includes a "Bubbliography," which lists some other great resources. 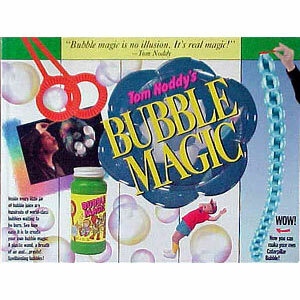 Tom Noddy donated a copy of Bubble Magic to the Bubble Blower museum. Click to see his Bubble Magic website, and learn more about him on this site in the Human Bubble Blowers area.